Over the past year, I've related the fruition of a dream come true, the conversion of "lost" videotaped performances of important Chicana Chicano poets and writers into modern DVD and web-streaming media. Look for an official announcement from the University of Southern California in the next few weeks on its receipt of the finished product, 39 recordings of such poets as Omar Salinas, rrsalinas, Oscar Acosta, and Tomás Rivera. Happily, Juan Felipe Herrera and the Tomás Rivera Archives at the University of California Riverside's Tomás Rivera Library acquired a number of photographs I shot back in 1973 at the first Festival de Flor Y Canto, held at USC. I'm happy to report UCR and the Tomás Rivera Archive will be showing these photos in conjunction with the upcoming Tomás Rivera Conference. Here's news from the Conference website. Please click here for mayor info. LIGIAH VILLALOBOS is the Writer/Executive Producer of the feature film Under the Same Moon, (La Misma Luna). The film was an Official Selection at the 2007 Sundance Film Festival and became the highest sale for a Spanish-language film in the history of Sundance. Since its release on March 19, 2008 by Fox Searchlight and The Weinstein Company, the film has become the 3rd highest grossing Mexican film and the 6th highest grossing Spanish-language film in the U.S., of all time. The workshops are open to all students and community members at large. Learn from one of the first Latinas to make it into the Hollywood film industry. In addition to Villallobos' keynote, she leads a TV Workshop and a Screenplay Workshop, as part of the daytime program. See the Conference site for enrollment details. The conference is funded and coordinated by UCR Tomás Rivera Endowment/Department of Creative Writing and co-sponsored by UCR Chicano Student Programs, the Tomás Rivera Library – and Special Collections, CHASS First, Department of Theatre, Palm Desert Graduate Center, Riverside City College-Academic Support Program and the Inlandia Institute of Riverside. Join La Bloga friend Carlos Callejo and the City of Piru for the dedication of Callejo's just-completed mural, above. "The Piru Mural -- A pictorial history of the town and its people." 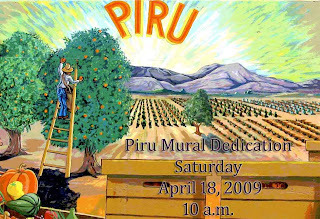 The dedication of the mural to the Piru community takes place on Saturday, April 18 at the mural site, at 10:00 a.m. The site is East of Piru Creek, north of Center Street, on the Piru Camulos Bike Path. From Highway 126, exit Center Street. Park by Piru Motocross. I am searching for a fiction book which depicts Latino/a trials and tribulations of young Latina/os trying to go to college. Have a suggestion? Please click on the Comments counter below. Bits and pieces for April's initial Tuesday, a day like any other day, except we are here, ¿que no? La Bloga welcomes your comments on the above, especially a novel about the Chicana Chicano Latina Latino college experience. Click the Comments counter below. La Bloga welcomes guest columnists. When you have a review of a book, an arts or cultural event, or an extended comment or bone to pick with one of La Bloga's daily reviewers, email las blogueras los blogueras with your proposal. Gary Soto's "Jesse" come to mind. My grandmother Lupe was raised in Piru after her family came from Guanajuato during the revolution. She and all her family grew up on the ranch there picking oranges. She met my grandfather there and they came to L.A. but Piru is an important part of our family history.